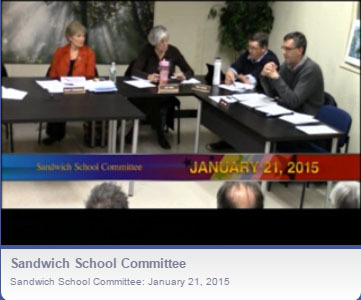 In Sandwich, we are very lucky to have Sandwich Community Television broadcast and archive the video of many of our public Boards and Committees. The meetings are long and complex, and a variety of important topics are discussed. 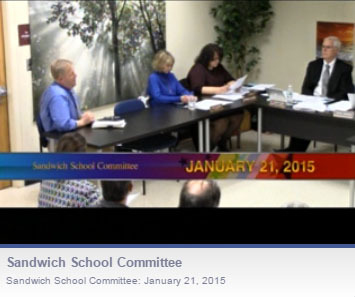 This article includes a link to the January 21, 2015 School Committee and a guide to its topics. 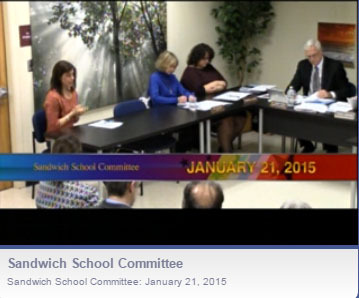 The January 7, 2015 School Committee meeting, with a guide to different parts of the meeting was previously published on Sandwich Learns Together here; the January 14, 2015 School Committee meeting was published here. The January 7th and 14th meetings were Budget Workshops and included the Finance Committee at the table to ask questions about the proposed Superintendent’s Budget. 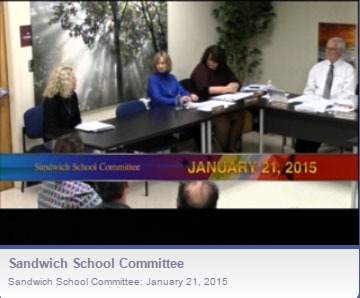 Click here for the January 21, 2015 Meeting and Public Hearing; a guide to different parts of the meeting is below. @1:25 After the Call to Order and Pledge, SC Chair Travis Andrade made a request for flexibility, pointing out that the room was at capacity and there were overflow attendees in the library. He suggested that once someone spoke, they can move over to the library to let others into the room. 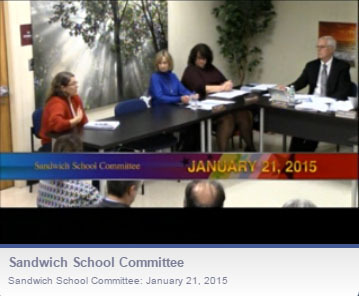 On March 27, 2014, the School Committee made a motion and voted to direct the superintendent to work with School Committee counsel and the Board of Selectmen to address vacating by August 2015. 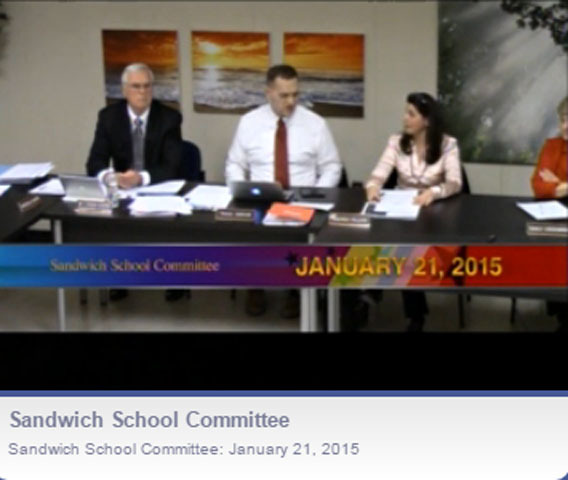 The MOU needs to be voted on by the School Committee and signed. The presentation is tonight; the vote will be at a subsequent meeting. @33:19 Mr. Dunham explained the timeline: The formal vote to transfer the “Care, Custody and Control” of Wing to the Town will be taken at a Town Meeting at a later date. $350,000 of the total amount in the two articles combined is based on moving coasts and renovations, including bathroom renovations for our Pre-School and Spinnaker. The additional costs (bringing the total to $415,000) is for additional bathroom renovations and enhancements and safety enhancements recommended by the Joint Safety Task Force. Further information and a clarification regarding the total costs of moving and renovations is published in Sandwich Learns Together here. We need 45 minutes between bus runs and the latest the school day can begin is 9:00am. Please go to the video for this section of the meeting. Listing the topics and the responses or paraphrasing the remarks of the prepared and articulate parents would not provide a clear picture of this section of the meeting, which was very interactive.